Launched in 1973, the Leisure 23, designed by Frank Pryor, proved an immediate success. Introduced two years later, the Leisure 23SL has an identical hull and rig to the Leisure 23, but has a different deck moulding, featuring a wedge shaped coach roof and higher side decks. This increased the headroom by an inch in the cabin. Designed for serious cruising, the first thing that impresses most people about the Leisure 23 is the ample deck space, large deep cushioned cockpit and surprisingly roomy accommodation for up to five people. With a high ballast ration of 48%, the L23 proved a most seaworthy yacht. The hull is of one piece, moulded GRP, for minimum maintenance, with interior mouldings and bulkheads bonded in for exceptional strength and rigidity. A balsa sandwich deck provides further strength and excellent insulation. Fin or twin keel (hydrofoil section) versions were built, keels being in cast iron. Rudder and skeg are moulded GRP, with steel framework and fittings. A teak rubbing strake is standard to protect the topsides. Moulded non slip areas on deck provide a secure foothold whilst working forward. 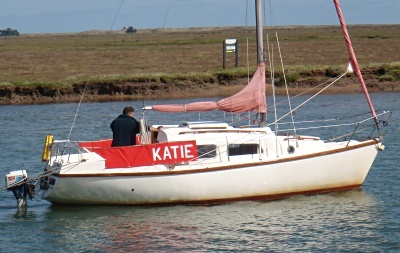 An outboard engine (8-10HP) was fitted as the standard auxiliary, but many are fitted with a 10HP inboard diesel engine, usually a Volvo Penta Saildrive unit. The spars are in aluminium alloy. Originally gold, the spars of later boats are black or silver. All standing rigging and rigging screws are in stainless steel and halyards are internal to the mast. The accommodation comprises a main saloon cabin in a dinette arrangement, with a large fore cabin. Two fore cabin arrangements were supplied, either with or without a separate toilet compartment. Five berths are available, although one is very short when a separate toilet compartment is fitted. A galley with two burner gas stove and a sink with freshwater pump is standard. Much use is made of teak and teak veneers throughout the cabin giving a warm appearance. Click on the following thumbnail images for a full size PDF of the brochure. The PDF will open into a new browser window. You can then scroll around the image, and/or select to save it to your own machine for later use. Leisure yachts (bar the Leisure 17) are seldom raced. The only yardstick information we have are various Club Numbers (CN) and a Recorded Numbers (RN) as follows. RN Recorded Numbers are published by the RYA on the basis of limited information. CN Club Numbers are allocated by Clubs. More up to date information may be obtainable from the Byron web site.